What was Jesus doing when the ship was covered with the waves? Brother Branham said, "Always remember what we're here for, is to try to increase your faith in His ________, that you might receive that which you ask for. Then, by faith, you believe." He's the High Priest of our ________, therefore He cannot do anything for us until first we confess that He has done it. You can't make yourself believe. Why wouldn't the doctor let Brother Branham in to see the dying boy when he got to the hospital? Brother Branham compares real genuine faith to what? Who spear headed one of the greatest and last revivals this world will see, a world-sweeping revival? Which disciple did Brother Branham say was just a little bit skeptic when Andrew told him about Jesus? In one of the disciple's stories, when did their hearts jump because they thought Jesus had failed? It might have been young ____ that said, "You know, I'll tell you what made it real to me, that day when He broke the bread." What did Brother Branham say was killing the generation? It's changing the posture of women, and man is made up out of a bunch of muck. When Jesus turned and said to the twelve, "Will you go also?" Who said those notable words, "Lord, where would we go?" When Jesus got into the ship, He knew what was going to happen. Why was He letting it happen? On another occasion, when the disciples were about to sink again, what did they do when they seen Jesus come walking on the water? When the Christian Science woman told Brother Branham that he bragged too much on Jesus, where in the Bible did she base her argument? When the woman touched Jesus' garment and was healed, it was God using His gift? Remember, Jesus Christ never performed one miracle, never did anything in the way of the supernatural, until first He ___________. There is no man has power to heal. Here are the current quiz results for Calling Jesus On The Scene. 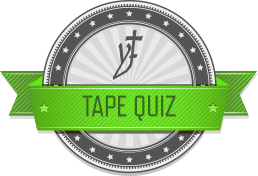 Anyone taking the quiz after Sunday, March 23, 2014 will not have their score posted.